Hey, Toronto – if you have a shred of dignity – stop your whining! In my entire life, I have never experienced a major city that does more sports whining than Toronto. I mean, it’s constant. If something is wrong, they whine. If something is just OK, they whine that it’s not perfect. If something is great, they whine that it’s not great enough. They make Rodney Dangerfield look like he was happy with the respect he got. And this week’s bolting of Chris Bosh to the Miami Heat has magnified an already appalling pattern in Canada’s largest city. He’s gone, get over it, Toronto. The Toronto sports community has become nothing but a bunch of complainers. I’m talking about media, fans, team managements and even casual sports followers. 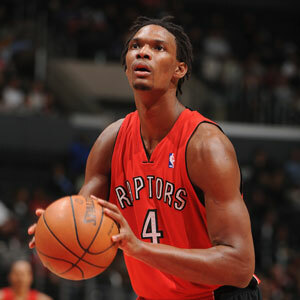 Chris Bosh played for the Toronto Raptors for seven seasons. Did they do anything significant in his tenure at Air Canada Centre? No, they did not. Now, for some reason, Toronto thinks Bosh owes them something. They want a press-conference explanation for his departure. They wanted him to demand a trade, so the Raps would have received a player or two in return. Funny thing is, if Bosh had, at one point, indicated that he wouldn’t be re-signing in T.O. and asked for a trade, he would have been verbally hacked to death. Toronto is never, ever satisfied with any team or its players. Chris Bosh owes the City of Toronto absolutely nothing. The guy is as classless as about 99% of all professional athletes these days. Forget him and move on. Quietly. Confidently. How about the Maple Leafs? I bet you know in what year they won their last Stanley Cup. I just asked my 13-year old son, who is not remotely a sports fan, and even he knew it was 1967. You’d think it was the longest drought in NHL history. It is not. In fact, if the Chicago Blackhawks had not won this year, their drought would have been going on 50 years. Not a soul knew that. But Toronto would have you believe their hardship is the worst ever. Beyond tolerance. More than the city can bear. I’m gonna be sick. 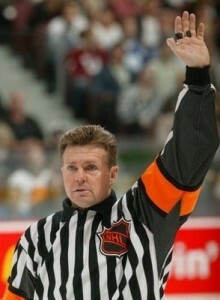 OK, so referee Kerry Fraser missed a call at the Fabulous Forum in 1993. Forget it, Toronto! They still whine about Wayne Gretzky’s high stick into Doug Gilmour’s face in Game Six of the 1993 Campbell Conference Final. OMG…it was 17 years ago! Let it go, already! You wouldn’t have beaten Les Canadiens in the Stanley Cup Final anyway. 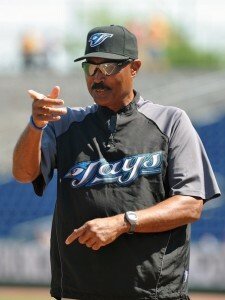 There is always something wrong with the Blue Jays. Overbay’s not hitting. Cito’s not intense enough. He doesn’t know how to handle his pitchers. They’re not spending enough. They’re spending too much. The dome is open, when it should be closed. The dome is closed, when it should be open. During the G20, the Phillies/Jays series was moved to Philadelphia – and Toronto got screwed out of seeing Roy Halladay pitch. He pitched in T.O. for 12 years! He made about 150 starts at SkyDome/Rogers Centre…and now you want to see him pitch? Toronto, you need to let things go. There are few North American cities that live and die with their hockey team harder than Toronto does. A Stanley Cup parade in Toronto would be one for the ages. I would give anything to experience that with my family. But the whining has got to stop. It makes the city look like a small child who’s not getting his/her way. Cleveland hasn’t won a major sports title since 1964 – and old LeBron just gave them the high, hard one. Toronto isn’t the only city who’s been snubbed by a lacking-in-character NBA player or a referee who made a bad decision. Move on – for your own sanity. You may be right about the whining but I hardly think you are in a position to say that Toronto whines more than any other major sports city. Have you lived in Vancouver, Montreal, New York, Boston, etc? I think not. Also there are more of us here than in most other cities so you hear us more often. But lets look at the reasons. How about the owners that go out and hire poor managers, coaches, etc and then expect Toronto fans to be happy with our teams performance. What has Colangelo done for the Rapter fans of Toronto? What about that sad sack that Peddie and the rest of the jerks at MLSE hired to manage the team by the name of Ferguson? Lot to cheer about when he was running the show. Jury is still out on Burke. Then we have the Jay’s that stuck for to many years to a moron called Ricciardi. Much more to cheer about. Maybe you are right and Toronto fans whine more than most major sport cities but looking over what the above cast has given us over the years it’s hard to blame the fans. In fact, I have had the good fortune to travel to practically every major city in North America over the past 25 years or so. Toronto’s brand of complaining is unique. And I agree with you completely about Toronto fans not having much to cheer about when it comes to the quality of their teams…but isn’t part of being a fan taking the good with the bad? Problem is, Toronto has had to endure a heaping pile of the latter. ” Taking the good with the bad? ” That’s all we have had for years. You said so yourself. This city has more to complain about than most if not all major cities in North America. At least they have a team or two that make or even go two rounds in the play-offs. I think one of the biggest side effects of free agency was the negative impact it had on sports reporting. The reporter/athlete dynamic changed from a congenial fraternity to confrontational adversaries as the salary discrepancy increased. Now everything is seen through the fog of financial worth or off-field sensationalism. Makes for lots of complaining. That’s exactly right…the more you know, the more there is to complain about.